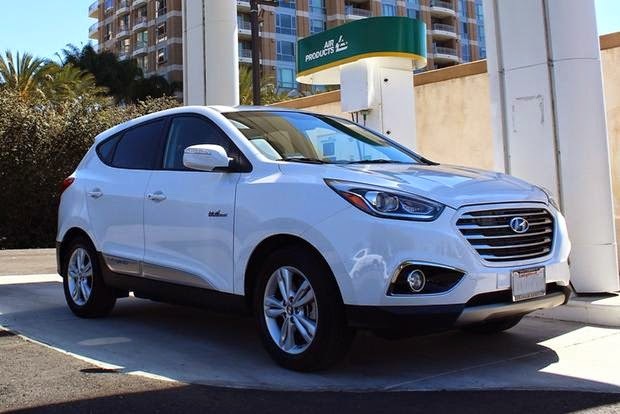 The 2015 Hyundai Tucson Fuel Cell provides an intriguing glimpse into a post-petroleum future. The question, of course, is what we'll use for fuel in lieu of gasoline or diesel. In the case of the Tucson Fuel Cell, the answer is hydrogen. Engineers have long been intrigued by hydrogen. It's the most plentiful element in the universe, and it also burns clean; the only thing that comes out of the Tucson Fuel Cell's tail pipe is water. The downside is that all those hydrogen atoms in the universe are joined to other atoms in molecules (water, for example), so in order to isolate pure hydrogen for use as fuel, it needs to be split from its molecular companions. That requires energy, and the challenge is to ensure that renewable sources are employed. Using electricity from, say, a coal-burning power plant would defeat the environmental purpose. But earth-friendly hydrogen separation is certainly plausible, and that's why hydrogen-powered cars continue to be hailed as a potential solution. What's cool about the Tucson Fuel Cell is that it's more than just a science experiment. It's actually available to the general public, at least in California. If you pass the screening process, including a quiz about driving habits to determine if, for example, you're unlikely to run out of fuel halfway to Phoenix, you can lease one for $499 a month for 3 years, and the state of California sweetens the deal with a $5,000 rebate. Plus, get this: Hyundai even pays for all the hydrogen you use. We were intrigued, so we scheduled some seat time in a Tucson Fuel Cell to see if it's ready for prime time. Not to spoil the ending, but the answer is a resounding yes. 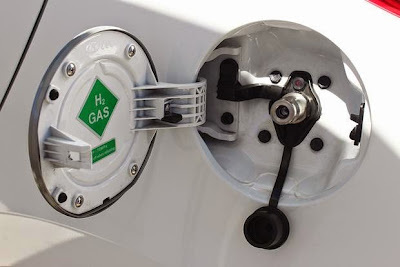 What remains to be seen is whether we'll ever see enough hydrogen filling stations across the country to make fuel-cell vehicles viable for the general public. In any case, here are a few impressions from our quick spin. EV stands for electric vehicle, as you probably know, and the Tucson is indistinguishable from an EV once you're on the road. An electric motor handles propulsion, so you get the same golf-cart-smooth responsiveness on the road, with a healthy 221 lb-ft of torque available from the moment you hit the accelerator. Around town, it even feels peppy at times. At higher speeds, however, the Tucson Fuel Cell runs out of steam, which is understandable given that the motor's only good for 134 horsepower and that the vehicle itself weighs more than two tons. We encountered a few long, steep hills on Highway 73 in Orange County that required constant full throttle just to gain a couple miles per hour. To the Tucson's credit, though, it didn't actually lose speed going up those hills, so we consider its performance adequate for real-world use. 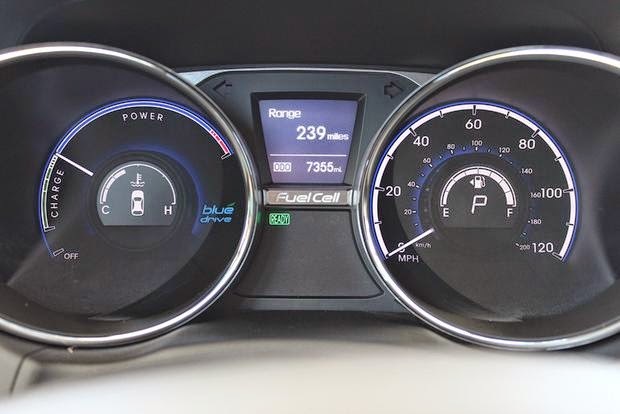 According to Hyundai, the Tucson Fuel Cell can travel up to 265 miles on a full hydrogen fill (see below), which is a lot more range than any current EV aside from the Tesla Model S. Score one for hydrogen power on this count. As an owner of a fuel-cell vehicle, you have to be trained and certified to use each individual filling station, and we can see why. We visited two hydrogen stations during our drive, and each used a different interface and even had a different pump nozzle. The process starts when you confirm that the station is online and enter your station-specific PIN on a keypad, which activates the refueling session. There are two available fill levels, with 700 bar representing a full fill and 350 bar representing a partial fill. Availability depends on the cooling status of the station's hydrogen reservoir; if it's too hot, you might only get a 350-bar fill. A full 700-bar fill takes about 5-7 minutes, and when you disconnect the nozzle afterward, it leaves a frosty coating on the Tucson's nozzle receptor, evoking the time-traveling DeLorean in "Back to the Future." It's a pretty cool process to witness firsthand, and truth be told, it's not that intimidating once you understand how everything works. The main issue we can see at this early stage is the lack of standardization from pump to pump. The 2015 Hyundai Tucson Fuel Cell is a remarkably well-executed vehicle considering its deeply experimental nature. If the government could snap its fingers and put a refueling infrastructure in place across the country, the Tucson Fuel Cell would be ready to hit dealerships from coast to coast. It drives like an EV except it has exceptional range and the ability to refuel in a few minutes. If we can somehow get those hydrogen filling stations built, the customers will come. Time will tell whether fuel-cell vehicles will ever get that chance.